A new species of scorpionfish, Scorpaenodes barrybrowni Pitassy & Baldwin, sp. n. which is described, was collected during submersible diving in the southern Caribbean as part of the Smithsonian’s Deep Reef Observation Project (DROP). It differs from the other two western Atlantic species of the genus, S. caribbaeus and S. tredecimspinosus, in various features, including its color pattern, having an incomplete lateral line comprising 8–10 pored scales, tending to be more elongate, usually having the 11th–12th pectoral-fin rays elongate, and by 20–23% divergence in the cytochrome c oxidase I (COI) DNA barcode sequences. It further differs from one or the other of those species in head spination and in numbers of soft dorsal-fin rays, pectoral-fin rays, and precaudal + caudal vertebrae. 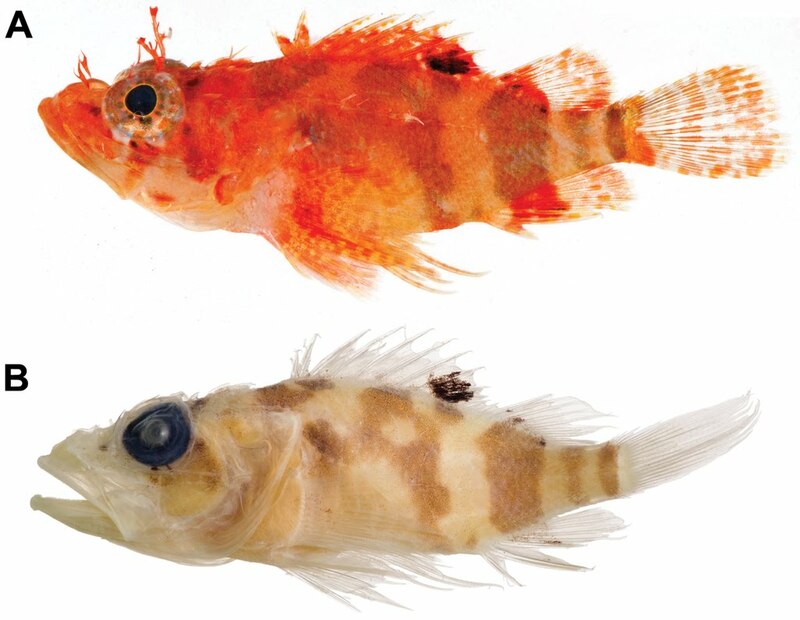 Inhabiting depths of 95–160 m, the new species is the deepest western Atlantic member of the genus (S. caribbaeus occurs at depths < 35 m and S. tredecimspinosus from 7 to 82 m). DNA barcode data do not rigorously resolve relationships among the ten species of the genus for which those data are available. 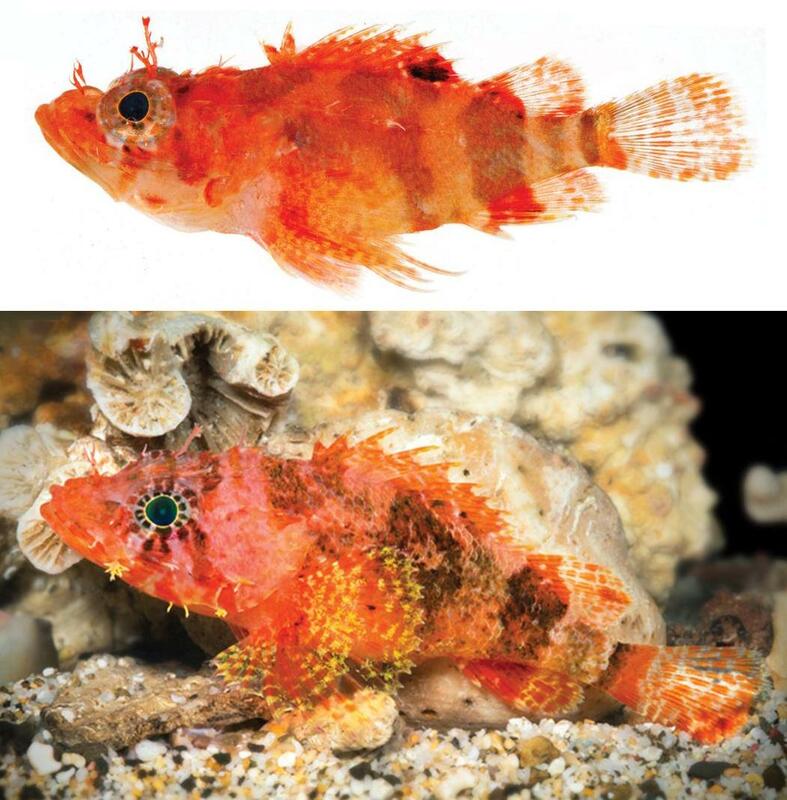 Diagnosis: A species of Scorpaenodes distinguished by the following combination of characters: dorsal-fin soft rays 8; pectoral-fin rays 16–17, rays 11–12 (from uppermost ray) noticeably longer than rest in smallest four type specimens; caudal-fin rays 25–27; vertebrae 24 (8 precaudal + 16 caudal); spines on suborbital ridge 4 (rarely 5); secondary suborbital ridge spines absent; two prominent round to oblong pores in suborbital sensory canal immediately ventral to suborbital ridge; coronal, interorbital, upper post temporal and postorbital spines absent; lateral line incomplete, 8-10 pored scales extending from behind supracleithral spine to mid body; cirri associated with nasal, supraocular, and parietal spines and present on posteroventral projection of lacrimal and upper left quadrant of orbit; no cirri associated with postocular, tympanic, supracleithral, and lower posttemporal spines; body relatively elongate, depth at origin of dorsal fin 30–32% SL, depth at caudal peduncle 9–10% SL. 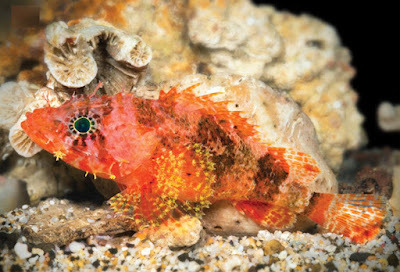 Color in life bright orange-red with several reddish-brown bars on posterior portion of trunk; pectoral fin with vivid yellow spots interspersed with bright orange-red spots. Distribution: Known from Curaçao and Bonaire in the southern Caribbean, and Dominica in the Windward Islands, eastern Caribbean. Habitat: Collected off Curaçao at 95–160 m on rocky substrata. Off Dominica, USNM 438436 was collected on a vertical rock wall. Etymology: Named in honor of Barry Brown, Substation Curaçao and free-lance photographer (www.coralreefphotos.com), who has patiently, diligently, and expertly taken photographs of hundreds of fishes and invertebrates captured alive by DROP investigators. He has generously shared his photographs, and they have enhanced numerous scientific and educational publications. An example of his work is here featured in Fig. 2A. Common name: Stellate Scorpionfish, in reference to the yellow, stellate chromatophores on the pectoral fin in life and the radiating pigment markings accentuating the eye. Spanish common name: Escorpión Estrellado. Carole C. Baldwin, Diane E. Pitassy and D. Ross Robertson. 2016. 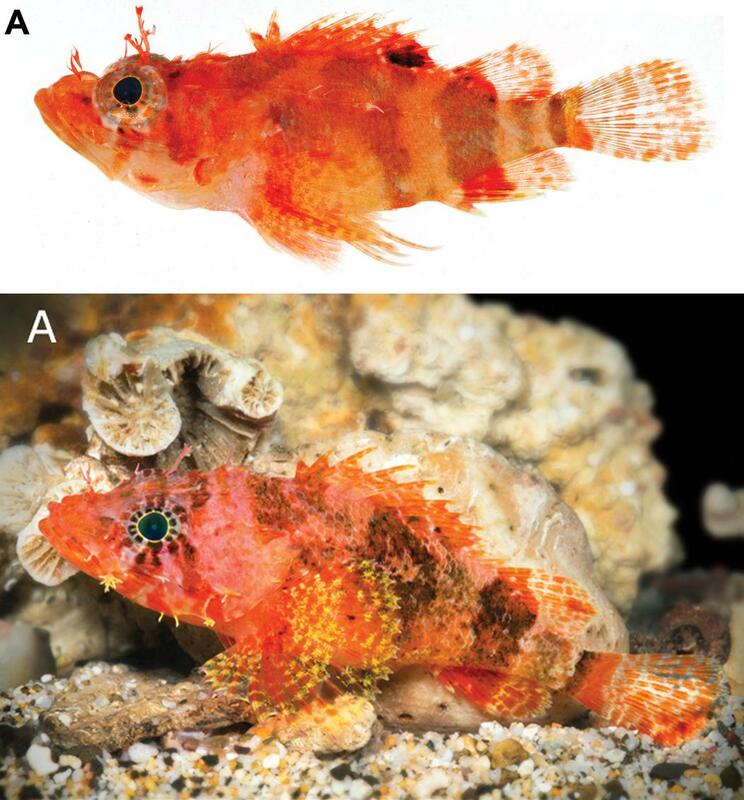 A New Deep-Reef Scorpionfish (Teleostei, Scorpaenidae, Scorpaenodes) from the southern Caribbean with Comments on Depth Distributions and Relationships of western Atlantic Members of the Genus.